Great staff and great location. Visiting from USA, I was worried about the communication, but had no challenge at all. The staff was very helpful throughout the stay. Property is in good shape and provided a great experience to us. The coffee in the lounge area, free for residents, was excellent. Great hotel. Good location. Excellent and helpful staff. Our only complaint is that the rooms need some updating. The appliances and bathroom sink vanity are old and worn out looking. But you can't beat the value and location. I stayed three night on May 20, 2017. The major construction is going on in front of hotel (they might be building a new hotel) and minor construction on the east side near fountain. Cooking utensils, oven, dish washer and microwave are equipped but very outdated, and didn't want to use at all. Overall room/bathroom is outdated and need significant update. Daily maintenance is not included. They will charge you around 19-30 Euros/night depending on the room. Don't go there. In this price (I paid 250 euros/night for studio), you may find cleaner (including daily maintenance) and better hotel near the opera or the arch of triumph. Taxis could not access front of hotel due to construction going on with the Les Halles Forum and surrounding projects. Room A/C did not work at all. I wanted to close the windows as noise from partygoers and the neighborhood nightclubs would go on throughout the nite into the very early morning. Just couldn't because the room would get stuffy. No pay channels on the tv and only English stations were CNN or BBC...I was extremely fatigued of hearing about Trump in the news!!!! Otherwise, location and view from room was excellent. Nice hotel with kitchen and extra living room. Location is near Pompidou and walking distance to many other attractions/neighborhoods. Lovely little outdoor market around the corner. Easy access to the metro and RER. Highly recommend. Great hotel I though the beds were kinda small so I got the double bed and it was perfect totally coming back! We had a large room but unfortunately, the WiFi did not work and the plug in the bathroom didnt either. Otherwise, it was central, comfortable, and convenient. The neighborhood was not very pleasant. The hotel was located in a very nice vibrant area. At night, you could go out and enjoy the many small restaurants open till early morning hours. The room was very comfortable. The staff was very friendly. I will stay in the same hotel during my next trip to Paris. Large, clean, comfortable room!! Cannot go wrong staying here!! Helpful staff!! Close to major Metro stop. Easy to get to the CDG by train. Excellent bakery close by, La Parisainne which won the award for best baguettes for 2016!!! Great Thai food, Baan Thai. Walking distance to Louvre, Notre Dame, etc. Shopping at Forun Les Halles is next door. Lovely area to walk around. There is construction outside the hotel but still a great place to stay. Highly recommend. Front desk staff very helpful. Beware of pickpocketers on the Metro!! Will enjoy your stay here!! The hotel was really good. The location is convenient to tourist destinations and major metro stops. The room is fully equipped with a small kitchen. The hotel is modern and the wifi worked very well. Great place for family stay. I loved how it's near metro line to CDG. It was a great stay. You got exactly what we're looking for. For a first in Paris this was perfect thank you thank you. Room was very basic and lacked comfortable finishings. Also, bedroom was very cramped with furniture, difficult to move around. Hotel lacked amenities that you would expect for the price. The location was good, central to many sights and the metro. The apartment hotel is perfectly located close to the Metro/RER station, Les Helles mall, Notre Dame and many restaurants. A bit busy location with young people hot spot but no need to be concern. The staff here are very helpful and friendly. I will stay here again when I visit Paris. Loved the room, comfortable bed, simple but functional furnishings, nice breakfast at reasonal price, staff are helpful and professional. Location is excellent. Will stay again. Located in Paris City Centre, Citadines Les Halles Paris is next to popular attractions like Les Halles and Rue de Rivoli. This 189-room, 4-star residence welcomes guests with in-room amenities like kitchenettes, refrigerators, and microwaves. Buffet breakfast is offered for a fee each morning from 7 AM to 11 AM. A flat-screen TV comes with satellite channels, and guests can stay connected with free WiFi. The bathroom offers hair dryers and free toiletries. Other standard amenities include a kitchenette, a refrigerator, and a microwave. Housekeeping is available on request. Guests of Citadines Les Halles Paris enjoy features like a fitness center, free WiFi in public areas, and laundry facilities. For transportation, you can make use of an airport shuttle (available 24 hours) for EUR 120 per vehicle one way, as well as an airport shuttle. The front desk has multilingual staff on hand 24/7 to help with concierge services, securing valuables, and dry cleaning/laundry. This smoke-free residence also has a TV in a common area. Dear guest, Thank you very much for your feedback. It was a great pleasure to have you here. We really hope to see you again very soon. Dear guest, Thank you for taking the time to write this review. It is great to have you stay with us. We appreciate your review and the compliments about our service and facilities. We hope to welcome you again in Citadines Les Halles. Thank you of sharing your feedback. We are happy to see that you have enjoyed the location. Regarding the other observations, we are planning a refresh of our product in the next future so we hope you could come again and see it. ideal location for touring paris. Thank you for sharing your experience. We were delighted to learn that you enjoyed your stay with us. At the same time, we are happy to have met your expectations in service and quality standards. Receiving such positive feedback from our residents motivates us to further improve our commitment to delivering good service. We look forward to welcoming you again at any one of our serviced residences. Dear David, Thank you for your feedback. We read with much concern about the unpleasant experience you encountered during your previous stay with us and we are sorry to learn that we were not able to make your stay more comfortable. We have brought each points raised to the immediate attention of the respective department head for improvements. Our building have been totally renew in 2011, and every year we refresh every room. We have a big unit apartment for Paris, around 25 sq2 for the studio and 35-40 sq2 for the apartment, you can check the competitors and you going to be lucky of you found at 20 sq2 room for the same price. The construction will be finish this summer, you will enjoy a fresh new area. The purpose is to ensure that his concerns are addressed promptly with the objective of making his stay with us a pleasant one. In this instance, the management of the property was unaware of the incident and is very sorry to learn that you were left with an unpleasant experience. We hope that you would reconsider staying with us again, giving us another opportunity to serve you better. Dear guest, Thank you for taking the time to write this review. It is great to have you stay with us. We appreciate your review and the compliments about our service and facilities. For legal & ecologic reason air-condition is start is the mid of may until the mid of october. The picture with the view from you room is amazing. Our sreet is pedestrian, if you come with a taxi please give the adress : 37 rue saint honoré 75001 Paris to the driver. 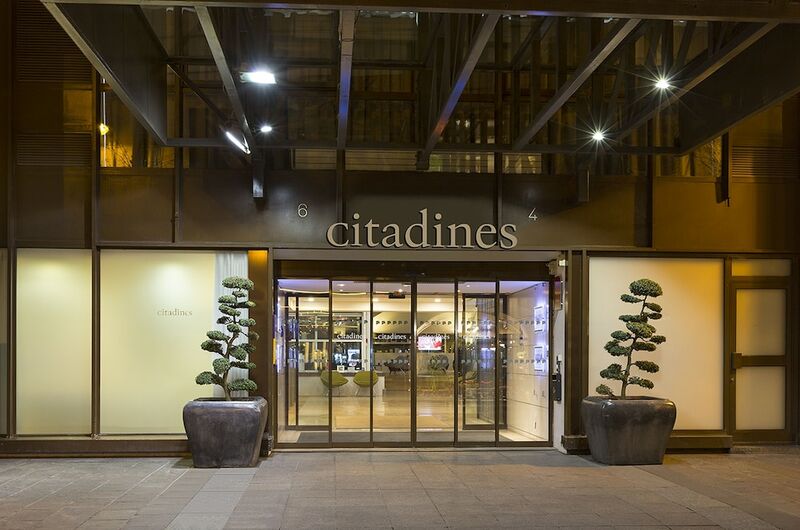 We hope to see you again in our residence Citadines Les Halles. Dear Guest, Thank you for taking the time to share your feedback. We were delighted to learn that you enjoyed your stay with us. At the same time, we are happy to have met your expectations . Receiving such positive feedback from our guests motivates us to further improve our commitment to delivering good service. Sorry for the bad feeling regarding our front desk, this is really unlike our staff, we will have a serious talk with them. Once again, thank you for your valued patronage. On behalf of the entire team, we look forward to welcoming you back at Citadines les Halles or any one of our serviced residences within the Ascott group. Kind regards. Thnak you very much for your review! We wish to welcoming you back soon! nice hotel with convenient kitchenettes. Recreation features at Citadines Les Halles Paris include a fitness center. The preferred airport is Paris (ORY-Orly). The front desk is open 24 hours a day. For convenient arrivals and departures, you can take advantage of the airport shuttle (available 24 hours). The following credit cards are accepted: American Express, Diners Club, JCB International, Mastercard, Visa, and Union Pay. The residence provides transfers from the airport (fees apply). To make arrangements, contact the property with arrival details prior to travel, using the phone number on your booking confirmation.